Information architecture determines how content will be organized and managed. An effective information architecture enables people to step logically through a system confident they are getting closer to the information they require. 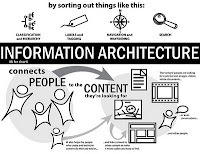 Organizations should recognize the importance of information architecture or else they run the risk of creating great content and functionality that no one can ever find. Most people only notice information architecture when it is poor and stops them from finding the information they require. If a website is difficult to use, people leave. If the home page fails to clearly state what a company offers and what users can do on the site, people leave. If users get lost on a website, they leave. If a website's information is hard to read or doesn't answer users' key questions, they leave. For Intranets, content management systems, web portals usability is a matter of employees productivity. Time users waste being lost on your intranet or pondering difficult instructions is money you waste by paying them to be at work without getting work done. If it is a customer serving or e-commerce website, it is a lost sale. Developing an effective information architecture is an essential step in the development of all information management systems. Effective information architecture enables people to quickly, easily and intuitively find content. This avoids frustration and increases the chance that the user will return to the system the next time they require similar information. development and management customized taxonomies.